When fans first heard that comedian Russell Peters had included Malaysia in his ‘Almost Famous World Tour’, they were delighted – and it showed with a social media frenzy. Tickets for the show to be held on 10 April, 2015 at Stadium Malawati, Shah Alam, sold out in less than a week, with 90% of tickets purchased in 24 hours. LOL Events is thrilled to announce that the show will be extended to a second night in order to cater high demands both locally and regionally. More fans will be given the opportunity to catch the Canadian comic live in action with the second show scheduled on Saturday, April 11, 2015 at Stadium Malawati, Shah Alam. 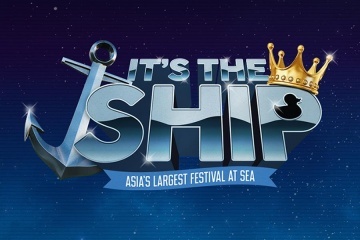 This event is supported by Malaysia Major Events, an agency under Ministry of Tourism and expects many tourists to travel down to see the show in Malaysia. 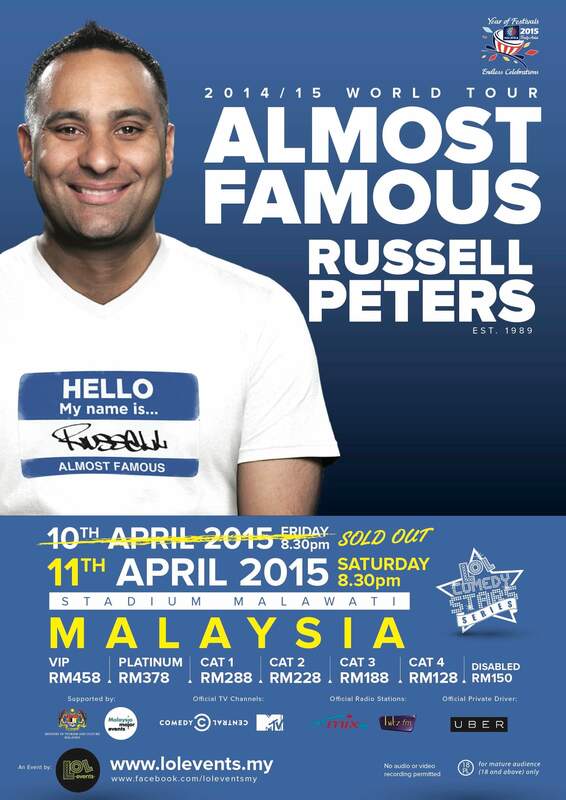 So far, Russell Peters has only announced Singapore and Malaysia as his stop in Southeast Asia. Other partners for the event include Comedy Central Asia, MTV Asia, Mix FM, Hitz FM, Enrich by Malaysia Airlines and Uber. The ‘Almost Famous World Tour’ promises ALL NEW MATERIAL featuring observational comedy, highlighting Russell Peter’s opinions on ethnic and cultural stereotypes, jobs, the usage of cell phones and dating. The tour will also see appearances by ‘Fastest hands in New York’ DJ Spinbad as Russell’s Official Tour DJ and an opening act. True to his form, Russell has clearly gotten to know the Malaysian way as he talks about visiting the country again, “I had a great time in KL in 2012, so I’m pretty pumped about coming back and seeing ‘uolls’ in April lah!”. Yes, this is an actual message directly from Russell Peters. Tickets for the second show in Malaysia will be available to the public from Saturday, 14 February 2015 at 10:00 AM (local time) through Ticketpro Malaysia. Tickets can be purchased online through Ticketpro’s website (www.ticketpro.com.my) or at Ticketpro’s outlets nationwide. 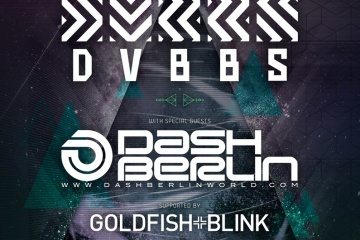 Tickets range from RM128 to RM458 and are comparatively cheaper than those offered in Australia and Singapore. Customers are reminded that a maximum of 10 tickets will be allowed per transaction/customer. Tickets for disabled customers are only available from Ticketpro outlets at RM150, and will require the presentation of a PWD card. Russell Peters, is best known for his cultural anecdotes having grown up as a Canadian born Indian. He is notorious for selling out shows all over the world and has made more than 100 million people laugh on YouTube. He is also highly acclaimed for his ability to keep audiences laughing on the edge of their seats with his lightning fast improv and amazing crowd interaction. LOL Events began its foray in the comedy scene since 2009 with the highly successful The Comedy Club KL shows. They then extended their range of comedy shows by producing the LOL Comedy Stars Series, Laugh Off Asia, Comedy Kao Kao and Kings & Queen of Comedy Asia. In over 5 years, they have hosted over 100 globally proclaimed comedy acts such as Jeff Dunham, Maz Jobrani, Ahmed Ahmed, Danny Bhoy, Kumar, and Sugar Sammy. Their latest mega show was the highly successful Jeff Dunham’s Disorderly Conduct Tour organized in both Kuala Lumpur and Singapore.